Porto's history pre-dates the Romans, with evidence of early Celtic and proto-Celtic settlements discovered within the modern city limits. However, it was the Romans who really put Porto on the map, with the burgeoning town developing into an important trading port. Like the rest of the Iberian Peninsula, it fell to the Moors during the 6th century but was retaken by on behalf of King Alfonso III in 868 by Christian warlord, Vímara Peres. His family become rulers of the region and dubbed it the County of Portugal, and is where the modern country gets its name. By the Middle Ages, Porto was growing in importance and in 1387 it was the scene of the wedding between João I and Philippa of Lancaster, daughter of England’s John of Gaunt, and thus the birthplace of the longest-standing military alliance in the world. Its prime location on the edge of the Atlantic also made it the departure point for mediaeval and Renaissance explorers, among them Henry the Navigator who used it as the jump off point for his exploration of the African coast. Although a wine trading city from the very beginning, it was in the 18th century that Porto really began to rake in the cash – thanks in no small part to the UK which imported the port wine from the nearby Douro Valley in huge quantities. As a result, wine became big business and the wine was shipped out to buyers in other European countries from Porto and then to the rest of the world. Porto has broadened its commercial base considerably since then, but it remains Portugal's most important trading city. With strong links to the rest of the world it remains a self-confident and independent city with a will of its own. Its bloody-mindedness has been expressed both militarily and politically over the centuries, and Porto is often referred to as the Cidade Invicta (‘The Unvanquished City’) as it has never been conquered, although plenty have tried and failed. • Porto’s citizens are known as Tripeiros because they gave their best meat to Portuguese sailors in the 15th century, leaving themselves the cut offs like tripe. • In 1958 and 1960, the streets of Porto, known to the Formula One authorities as the Boavista Circuit, hosted the Portuguese Grand Prix. 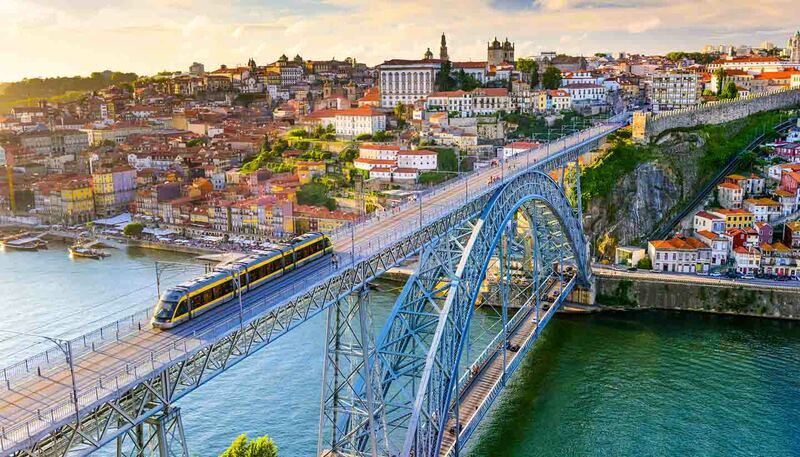 • Porto’s Maria Pia Bridge was built by Gustave Eiffel, the man behind the Eiffel Tower, in 1877.